Once again I had the honour of being asked to submit an article for AUGIworld by the Manufacturing content editor John Evans (Thanks John). With the theme of this issue being about teamwork and collaboration, I thought that it would be a good idea to talk some about DWF. If you've taken the time to digitally prototype your design with Autodesk Inventor, then you have a wealth of information available to your supply chain that may not be accessible from the paper drawings. DWF can be a great way to metaphorically roll up your entire data set (Drawings, 3D digital mo and BOM) to with your client, colleagues or subcontractors. In the article, you will find clear instructions on how to create the equivalent of a 2D 'Paper' drawing set. You will find out how to export the 3D mo along with the drawings, and include the BOM as well. Finally, I show you how to upload the entire thing to Autodesk 360 to with anyone in the world (well - anyone who has access to the internet)! Check out this review of Swift s 2.0, a FREE Beta Plugin from CADtoolbox.com that adds plot configurations to Autodesk Inventor. Are you struggling to include Item Balloons or Parts lists in Drawings from your Large Autodesk Inventor Assemblies? This tip could be what you need to stop you banging your head of your desk with frustration! 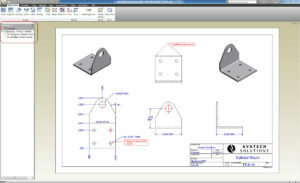 How to use Autodesk Design Review with Inventor, to create, mark up and round trip DWF files.